Newly renovated home with a sweeping view of the protected nature preserve and bay. Enjoy the open plan of this home with a cooks kitchen and ample room. Well decorated inside and out. There are two decks, one to watch sunsets and for cooking and the other with a heated pool. Make sure to check out the video of the view from the upper deck in this listing. Only a two block walk to the bay where you can enjoy swimming, kayaking and paddle boards. Just a Short bike ride or car ride to West Hampton Beach. Minimal rental is 21 nights. Excellent value for a home with a water view in the hamptons. 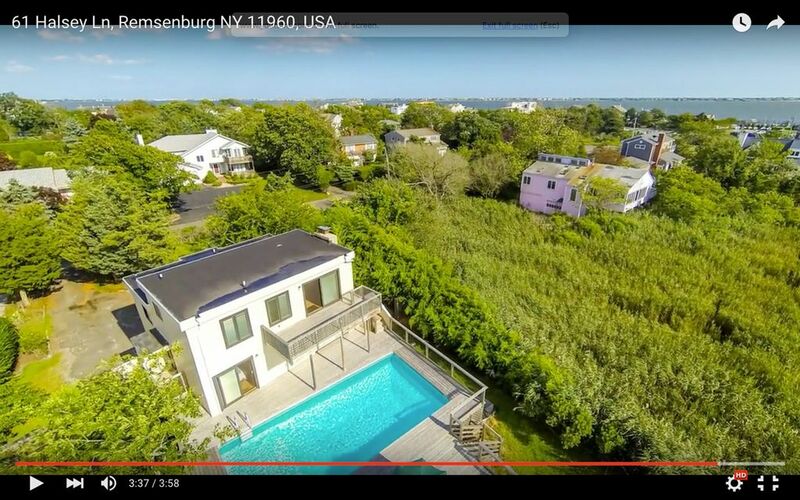 Enjoy one of the best kept secrets in the Hamptons - the town of Remsenburg, which is a tiny hamlet that sits next to West Hampton. Experience life in the Hamptons without the crowds and only 1 1/2 hours from Manhattan! Our home is newly renovated and in mint condition and has a heated pool. Enjoy kayaking and/or paddle boarding in the Moriches Bay that is only 2 blocks away! There is plenty of room in the garage to store your bikes and other "toys". Great location for biking, walking and running. Few minutes away from the town of Westhampton, and Westhampton Beach. Open concept Kitchen fully equipped with stainless steel appliances. Ample area for children to play in the fenced in backyard. 2 levels of Decks and pool. Wonderful house, beautiful sunsets, can't wait to stay there again! We recently stayed for 2 weeks at Marianne's house and I will definitely rent her house again! The house is located on Moriches Bay. She allows pets, and every morning, we took our dog down the street and walked along the bay. The living area on the top floor was one of the highlights, always flooded with the beautiful light that comes with being near the water; off the living area was a comfortable deck covered with a pergola and from which one had a clear view of the ocean and the most beautiful sunsets. The deck also had comfortable deck sofas, a dinner table and gas grill. Her house, which was very clean and tastefully decorated in light colors, had everything one would need on vacation including a big pool which the kids spent hours in. The house was very well located, close to the beaches on Dune Road and the village of Westhampton. I hope she continues renting her house, as we would love to go back! Thanks for the lovely review. Your family is always welcome. We really appreciate how well you took care of our house and I am very happy to share it with wonderful renters like you! Newly renovated house with breathtaking views. The house has 4 bedrooms and two baths and can sleep up to 8 guests. There are two decks and a pool. Walk only 2 blocks to the bay and enjoy swimming and other water sports.